Years ago, a bathroom was strictly a functional room. It had its purpose, but the idea of decorating a home bathroom didn’t occur to most people. But times have changed. 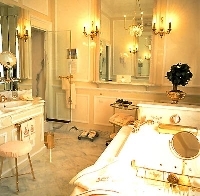 Bathrooms have become a significant part of the home decorating scheme. One of the most popular trends in bathroom design today is the spa at home experience. No expense is spared in outfitting the space with the finest fixtures, the most elegant materials and the most flattering lighting. The cost for a single bathroom remodel can easily run into the high tens of thousands. But with some careful planning, you can create a spa experience for a lot less. Start with these tips, add some careful shopping and the spa at home will soon be a part of your home. The first step to bringing the spa experience home is careful planning. If you’ve spent some time in a luxury spa, think about what made the space so special. Was it the oversized soaking tub? The multi-head shower? The mirrors and lighting? Make a list of the elements that made you feel pampered. And if you’ve never been to a spa, spend some time with some of the more extravagant home décor magazines. Create a folder or binder of pictures of the elements you’d most like to have in your bathroom design. Whether you’ve started from experience or magazines, choose the elements from your list or folder that are “must haves” for your new bathroom. This is the framework for your dream bathroom. Designing and decorating a home bathroom to feel like a spa requires more space than ordinary bathrooms. Before you go shopping for fixtures, lighting or décor, start by measuring the space very carefully. Be sure to note the location of outlets, plumbing, wall and ceiling lighting. While some of these things can be moved, it’s often more difficult than it appears, so it’s better to fit the new fixtures to the existing connections. Now comes the fun part....shopping for your new bathroom! Take your time and wander the showrooms in your area. Many decorator showrooms will allow retail buyer to browse their displays, although you may need to have a licensed decorator make any purchases for you. Gather samples of your tiles, paint colors, fixtures colors and other elements before you purchase anything. It may be hard to not purchase that perfect tub right away, but you'll be glad you waited if you can't find a matching toilet and sink later on. Although it may seem expensive, having a professional install your new bathroom fixtures will be well worth the time and effort it would take you to do it yourself. Unless you have a long history of home renovation, remodeling a bathroom is not the right project for you. The towels, the robes, the bath salts and body oils -- these are the parts of the spa experience most of us enjoy most. Decorating a home bathroom like a spa would not be complete without these special touches, so indulge your senses in the textures, smells and experiences of fine spa quality products. Once your home spa bathroom is complete, it's time for the very best part...using it! Pamper yourself and enjoy your surroundings. You've earned the experience!